You are currently browsing the archive for the Cybernetics category. 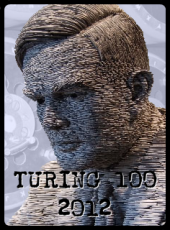 This Saturday (23 June) the School of Systems Engineering will be staging the famous Turing Test to mark the centenary of the birth of Alan Turing, mathematician and code-breaker. Turing100 takes place at Bletchley Park and visitors can see if they are able tell the difference between a computer and a human. Cybernetics professor, Kevin Warwick, Chair of the School of Systems Engineering’s Turing100 project, writes about what the Turing Test says about us. The Turing Test not only asks questions about machine communication, machine consciousness and how a machine thinks – it also causes us to ask important questions about human communication, human consciousness and how a human thinks. The test is merely a challenge that causes us to compare the two – from a human perspective. As a result it leads to another interesting feature and that is – how human interrogators can be easily fooled not only by other humans but by machines. Even after an interrogator has been so fooled it is then difficult to persuade them that they have been. It was Mark Twain who said “it is easier to fool people than to convince them that they have been fooled”. Perhaps the most important point here however is that people tend to over-value humans and how they communicate. The test considers a comparison between machines and ALL humans – however many humans have little of importance to utter and even then they make many mistakes when they do so; as Agatha Christie put it “Man is an unimaginative animal”. The largest set of Turing Tests ever, at Bletchley Park on June 23, will give us an insight into how far the best machines have come. But maybe they will tell us even more about ourselves as humans than they do about their own individuality.